It's the end of the school year again so it's party time and painting-on-canvas time. In previous years I've always had some painting lesson. One year it was hand prints, then silhouette painting and last year it was initials. 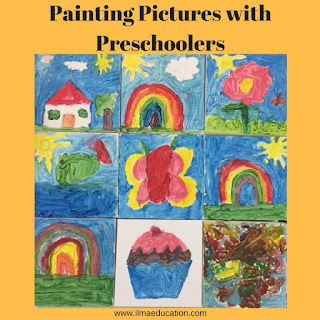 These were all based on the idea that it was easy to do in a class of prekinders but also students can add their own creativity to it. This year, however, I ran out of ideas that fulfilled my two criterias. When it was time for painting I still didn't have an idea. The only thing that came to me was to allow the children to paint whatever they wanted. Some children would be able to turn out a decent picture but most will likely make a brown grey mess (read my stages of painting). (That last picture demonsrates this. This child refused to listen to instructions so I let him do what he wanted.) This was the end of the year after all and I wanted them all to take home something to hang up and remember attending ILMA Education prekindy classes. I couldn't let them do it but I had no choice because I didn't have an alternative. So I compromised and decided to instruct two to three children at one time. It took longer than usual for all the children to complete their paintings but it was worth it. This was how I taught prekinders to paint their own pictures. 1. Ask children to draw in pencil a single picture. It must be large to fit most of the canvas not some incy wincy picture. 2. Choose one colour to paint in one part of the picture. 3. When they have finished that part of the picture and need to change colour then to dip the brush in the water to clean it and then dry by dabbing onto the sponge. This was the part that children needed to be reminded of all the time to keep the paint from mixing and turning into a dull muddy brown. 4. Take another colour and paint another section of the picture. Change colour by washing the brush. Continue in this way until all the picture has been painted. 5. If there is space around the picture then they can add another smaller picture such as the sun, a tree, grass, a cloud etc. (depending on what the main picture is). Use only one different colour. 6. Choose another colour and paint in the background, making sure that all white spaces are filled. Most of the children chose blue because their pictures required the sky as a background. MashaAllah, the paintings turned out really nice. It was well worth the time taken for all the chldren to finish. Now they can have something to take home and hang up and fondly remember prekindy at ILMA Education.